I’m Scott with Motivatedcodepro.com, thanks for coming back today is part 2 of a 6 part series, and today we’re going to talk about your skills and experience, stay with me. Welcome back, and thanks for coming back. I’m Scott, with Motivatedcodepro(.com), Part 2 of becoming a successful consultant as a software developer and this key of the 5 keys involves your skill and experience. So I want to talk for the next few minutes about your skill and experience, and I said in another video that I think you need to have 5 years of experience with your skill set or whatever you’re selling as a technology professional before you hang your own shingle out there, before you step out into the great big world, risk your livelihood, and everything you’ve worked for, up to that point. You need to have 5 years or you’re just not going to have the confidence, and the competence that I think a customer is going to expect of you, when you step out on your own. Now, I know there are exceptions to this. You can leave comments if you want to and tell me about it, but I know that. But, I also know that by and large most people do better when they have that 5 years of experience. And some of that goes to maturity, and length of time in a technology, that means you’ve spent enough time in it that you know how to solve pretty much any problems. And there are so many other things to think about, besides just your skill and experience if you have to scramble on a contract to get traction and to do the work that’s being put in front of you, that’s a bad deal. I, mean, in the previous video (___) this one here, I listed ten other things that you have to think about. And you know, things like growing your business, staying busy, tax and accounting, legal, marketing and sales, and you know, the whole ten. I will list them in the description and you can see them at motivatedcodepro.com in the blog post for this video. The point there, is simply that, there is so much to think about that you need to have your skills in the bag with what you’re selling. Because the day you step into the office, or you get on the remote to deal with your Day One of your contractor consulting opportunity you’re going to learn a ton of stuff to begin with and so you need to bring a lot of experience with you and I think the magic number is five years. And one more, you may have two years you may have twenty years, but I think five is the sweet spot. Experience is one of those things that cannot be taught, you have to live it, you can’t rush it. You can be really, really smart and I’ve seen savant level people that could do amazing things technologically but when you’re running your own business, when you’re stepping out, when you’re risking your livelihood and all that you’ve worked for, (this is my house that I’m waving at!) you better be confident and competent. You better have covered as much ground as you possibly can. And so I am encouraging you to spend, if you’re looking to do this and this is one of your goals, make sure you have 5 good years of experience and I keep saying it so it’ll echo for you. I really want that for you, you will be successful if you can do that. I am going to cheat and look at my notes here because there’s a lot of content I want to get through. So the thing about time, you need to use your time super super wisely, again we’re talking about skill and experience. I’m sorry, skill will get you paid and time is your greatest asset. Treat it like money and the way you spend your time is so important when you’re trying to run your company or you’re building your skill and experience. And let’s say your skills are sharp today, and I imagine they are. But what about tomorrow, and the next day, and the next year? It doesn’t take a crystal ball to see what’s coming down the pike generally. In technology things come and go very quickly but things that get traction when it comes to continuing your education or your skill I’m a big fan of working with what gets you paid, right? So stay in the things that get you paid. I’m not a big fan of wandering off into the technology du jour of existence and trying to learn new things unless you’re doing that for fun and you don’t want to get paid for it. I want you to work on things that are going to get you paid, period. Your business, don’t waste time. That’s it for today! I am Scott with Motivated Code Pro, that’s number 2 in the series of 6. Go to motivatedcodepro.com check out the blog post for this, have the E-book emailed to you, and keep coming back. See you on the next video! Yes, please sign me up for the MCP community. I don't want to miss any articles or videos about advancing my software career and achieving work life balance! Thanks for visiting motivatedcodepro.com. 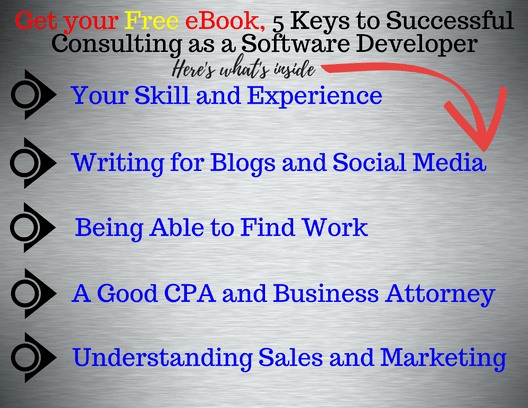 As a special thank you, I would like to give you a free copy of my eBook, 5 Keys to Successful Consulting as a Software Developer. To begin your download, please go to your inbox for the email address you signed up with on the previous page. Open the email from me (scott@motivatedcodepro.com) and click the confirmation button. Then, you will be asked to click the "I'm not a robot" checkbox. After that, just click the, "Subscribe to list" button. Finally, you will be redirected to a page where you can access your eBook, the 5 Keys to Becoming a Successful Consultant as a Software Developer. To complete your registration, please go to your inbox for the email address you signed up with on the previous page. Finally, you will be asked to click the "I'm not a robot" checkbox. Welcome to the community. I am so glad you joined. We have lots of things planned, but for starters, you will never miss an article or a video because you will receive an email from me telling you that I have posted another video or article and what the topic is. If you would like to write an article for Motivated Code Pro, send me your idea and I will review it promptly. I would love to hear about it.